Looking for adventure on the high seas? Need a village home base to launch your swashbuckling adventure? Island Keep may be just the ticket. 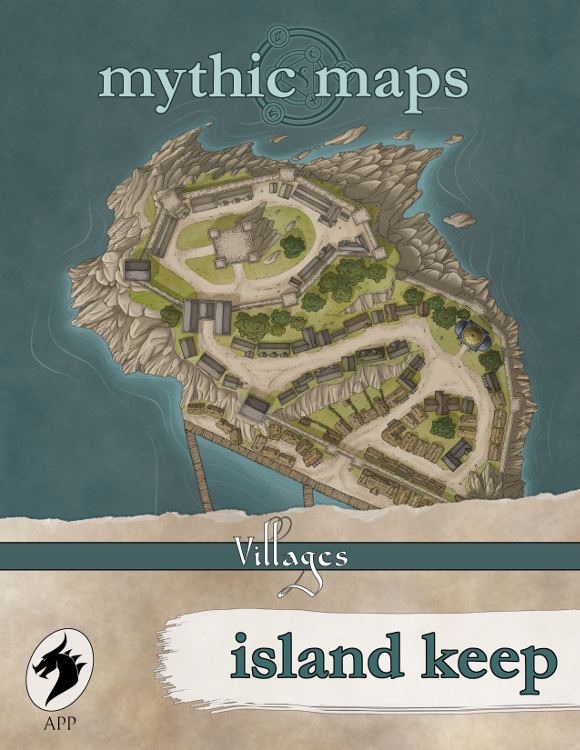 Whether the haven of an infamous pirate, the last bastion of a crumbling oceanic empire, or merely a port of call on a long voyage, Island Keep is a map sure to satisfy your needs. Ars Phantasia Press is pleased to announce our second product, “Island Keep“. This product contains several different high res .jgp images of the hand drawn village map previewed on the cover; a color image with labels, a color image without the labels, and B&W versions of each. The product also comes with PDFs that contain sliced up versions of each of these maps that can be easily printed at home and assembled into posters. You can find this and future APP products a DrivethruRPG.